Heeft u een vraag voor The Rest Prachachuen Hotel? Gunstig gelegen in Bangkok, is het The Rest Prachachuen Hotel een goede uitvalsbasis om deze levendige stad te ontdekken. Slechts 14.2 Km verwijderd van het stadscentrum, is dit een goede plek voor gasten om te genieten van de attracties en activiteiten in de stad. Dankzij de praktische locatie liggen alle belangrijke trekpleisters in de buurt van het hotel. Het The Rest Prachachuen Hotel biedt een onberispelijke service en alle essentiële voorzieningen om reizigers een plezierig verblijf te bieden. Maak in het hotel gebruik van een selectie topklasse faciliteiten, zoals gratis wi-fi in alle kamers, 24-uur beveiliging, dagelijkse schoonmaak, wasserette, taxi service. Het The Rest Prachachuen Hotel beschikt over 50 kamers, allemaal smaakvol ingericht voor optimaal comfort, met voorzieningen als plasma tv, vloerbedekking, oploskoffie, spiegel, handdoeken. Daarnaast garanderen de talrijke recreatieve mogelijkheden dat u zich tijdens uw verblijf kunt vermaken in het hotel. Wat de reden van uw bezoek aan Bangkok ook is, het The Rest Prachachuen Hotel is de perfecte keuze voor een enerverende vakantie. Houd er rekening mee dat de receptie van het hotel om 20:00 uur gesloten is. Houd er rekening mee dat bij het inchecken een restitueerbare borg van 1.000 THB in rekening wordt gebracht. The rooms are clean and very comfortable and it has thoughtful designed table for working, a fridge, a stove, dish basin and a balcony. It's very suitable for long duration stay if you're an engineer working on projects on the factories surrounding this area. 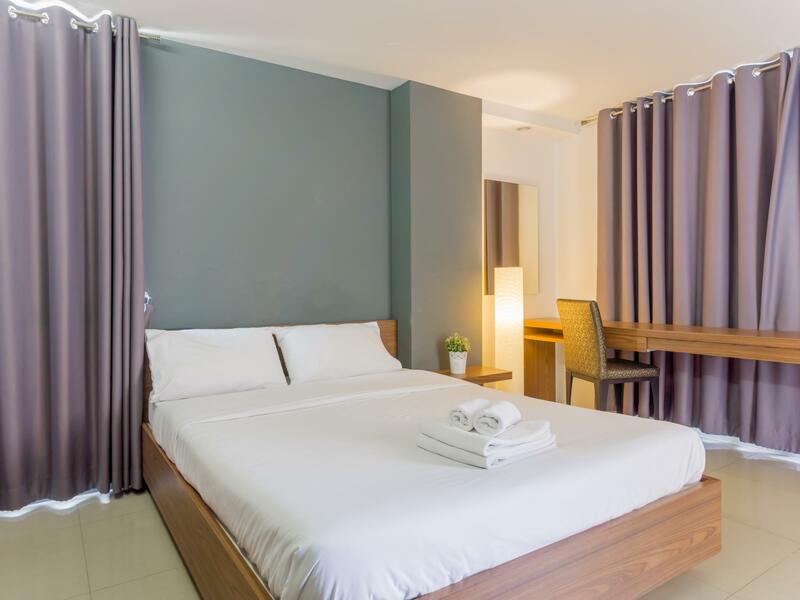 The hotel is situated near the Mo Chit Mai bus station and it has a night market and morning flea market nearby. However there are not shopping complex or restaurants nearby. There's a CP Mini Mart and laundry nearby. However getting to the nearest 7Eleven is a challenge as it's situated across the railway track with a busy main road crossing the railway track. The hotel requires a refundable deposit of 500 THB and the staff here speaks very limited English. Otherwise it would've been a pleasant stay for us. I've stayed at most of the hotels in that area and this is the best one by far. It's more of a small apartment turned into a hotel for some rooms. The front office is only open during the daytime, so make arrangements with the property ahead of time if you plan to arrive late. I arrived late on one of my many visits to the hotel and had no problems with the night security guard checking me in. There is a language barrier, so be kind if you don't speak thai.. I do not speak Thai, but I don't have any problems at this location. 7-11 is across the street, so is a great restaurant... this is a wonderful location! Thank you sir, We please welcome you again. There's a security guard on staff at all times it seems.. he can register/check you in outside of the normal front desk hours. I contacted the property prior to my arrival, i dont know if thats neccessary or not for everyone. There is a 7-11 across the street, and a great restaurant The Foodie next to the 7-11. The 7-11 is open 24 hours. 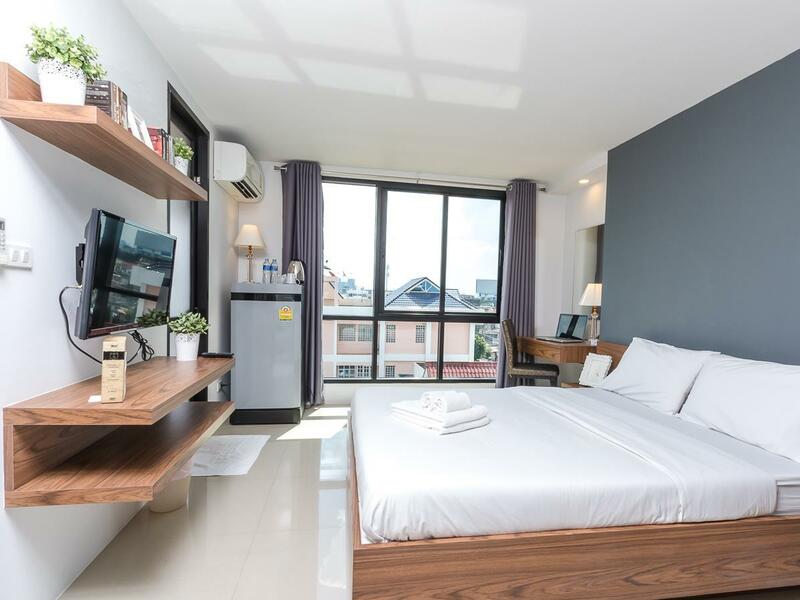 Although location is far away from shopping malls & bts/mrt, chosed this on our last night coz it is good value at 578 thb per night and closer to Chatuchak market and Mo Chit BTS/MRT (we took a private car ride for 90 thb, the driver is usually onsite, just ask reception staff). Clean room, comfy bed, clean bathroom, clean linen/towels, good air-con, 220 litre fridge, 1.8 x 2.4 m wardrobe, flat screen TV with 20+ channels. Provided 2 free bottles of water, 2 sachets of 3-in-1 instant coffee, clean towels & shampoo+body wash+disposable toothbrush/paste. Staff don't speak English well but I had no problem communicating with a bit of patience and gesturing. It was fairly clean, but no towels. The one towel we found was hanging in the closet and the shower floor was wet, as if someone had just taken a shower in the room before we got there, and hung the towel in the closet. The bed was a bit hard for our liking as well, but not full on Thai style. Bad-It's not good for short stay.Not near to BTS,MRT and Chakducha Market. No front desk from 6 pm to 8pm, there is only a security to guide you. Good- quiet ,near to Donmeung Airport.Main gate have security tag, it's safety. the room have a small balcony. Good standard hotel. Good Restaurant and 7-11 accross the street. Feb 2015 - room 403. This "hotel" is more like a short stay apartment without a kitchen. Hotel staff and amenities are limited. There are no staff minding the front after 9 p.m. and before 8:00 a.m. The room was reasonably clean the shower was clean tile. It is not well known by taxi drivers and located off the main road. There are very limited places to eat and shop near by, however there is a 7-11 across the street. Not easy to get a taxi from the hotel. For US$41 I've stayed in similar or slightly better places in Bangkok with more convenience. budget yet value for money. Nice rooms, but for tourists the location is not convenient. Room is clean. 7-11 is opposite the hotel. However it’s far quite far from MRT. 공항에서 택시비 얼마 안나옵니다. 공항에 늦게 도착하시면 좋은 선택입니다. 개인 금고가 없다는게 좀 아쉽네요. 나머진 만족합니다.